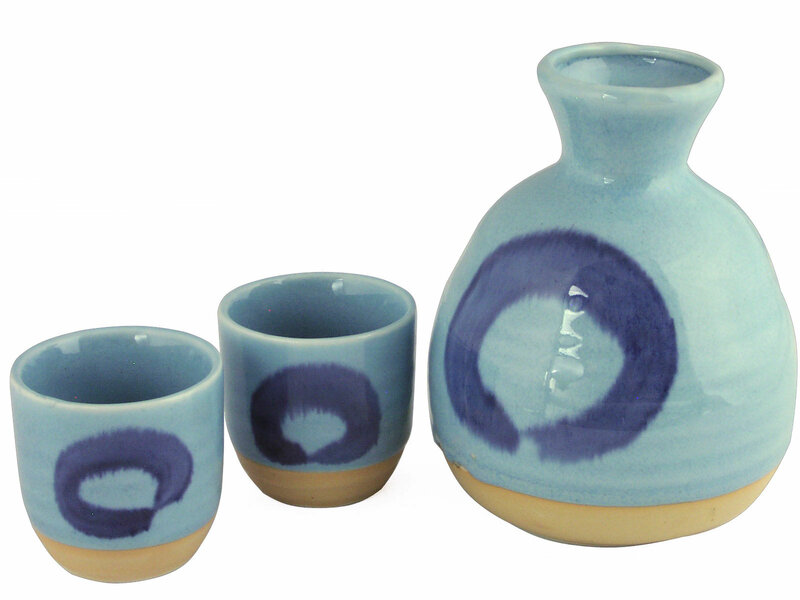 Made in Japan and crafted from ceramic, this sake gift set comes with a charming sake jug and two beautiful matching sake cups. In a lovely pale blue and a light beige, the colors bring to mind a summer sky and sand. With the simple yet graceful design of the enso-the Japanese zen circle, this sake gift set is an elegant way to enjoy your favorite sake with a loved one. The enso is a circle drawn in a single or in two strokes, and in Zen Buddhism stands for enlightenment, elegance, strength, the universe and the void. Beautifully simple, it is often featured in Japanese calligraphy. Glazed to a smooth glossy finish, this Japanese sake gift set feature a round sake jug great for serving both warmed and chilled sake. Sake set comes packaged in a paper box. Hand washing is recommended for this item.